Note: The basket is folded into a square shape, you may adjust the opening wire into round shape easily. These bins shouldn't be limited to just dirty clothes. They also work great as cute storage bins around the house. 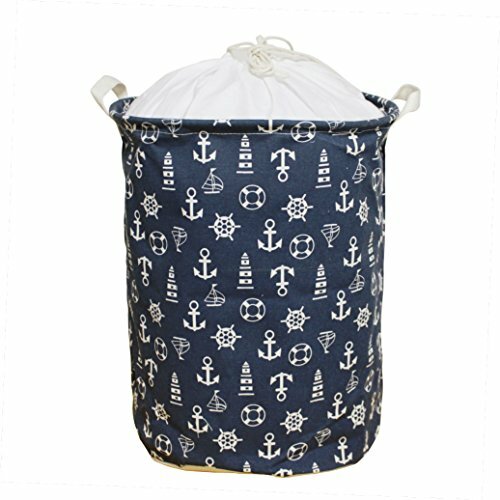 Use them as a storage bin in the bathroom for towels, stuffed animals in the kid's room or toys in the play room. Work great for small children as they can still get to their things without damaging the product. MEDITERRANEAN STYLE: A nautical, beachy set of baskets for all of your basket needs! The Admiral Linen Baskets are great for extra storage around the house in the most stylish way, made out of hardback linen and cotton accents. If you have any questions about this product by Orino, contact us by completing and submitting the form below. If you are looking for a specif part number, please include it with your message.